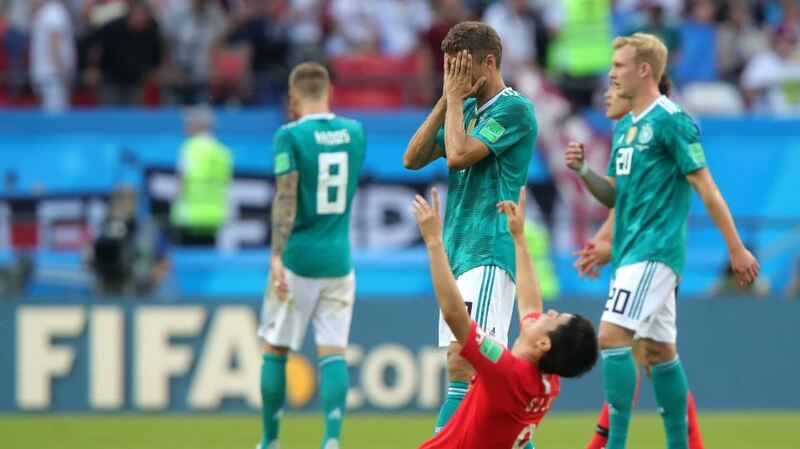 British Broadcasting Corporation (BBC): Defending champions Germany have been eliminated from the World Cup at the group stage following defeat by South Korea, in one of the biggest shocks in the competition’s history. The four-time winners crashed out in ignominious fashion – conceding twice in injury time as they pressed for the goal which would have sent them through. In an astonishing and enthralling end to the match, Kim Young-gwon’s 92nd-minute goal – which was initially ruled out for offside before being awarded after a video assistant referee decision – left Germany on the brink of elimination. Worse was to come for the world’s number one ranked side, however, when deep into stoppage time and appearing increasingly desperate, goalkeeper Manuel Neuer lost possession in the opponents’ half. Ju Se-jong launched it forward where Son Heung-min tapped into an empty net to score the second. That prompted jubilant celebrations from the South Koreans, while some Germany fans inside the shocked stadium were left in tears four years after watching their national team lift the trophy in Rio; a competition in which they beat the hosts Brazil 7-1 in the semi-finals. It is the first time since 1938 that West Germany or the unified Germany team has not advanced beyond the first stage of the tournament – Joachim Low’s side finishing bottom of Group F in this edition. Wednesday’s defeat followed their opening loss against Mexico, while it took a dramatic late winner from Toni Kroos to earn them their only points of the group stage against eventual group winners Sweden. Where did it go wrong for Germany? Manager Low, who led Germany to World Cup glory four years ago, will face strong questions over his selections both before and during this tournament. He left Manchester City forward Leroy Sane out of his squad, despite the 22-year-old playing a major role in helping City win the Premier League title, while Mario Gotze, who scored the winner in the 2014 final against Argentina, also missed out. Against South Korea, Low made five changes, including recalling Arsenal’s Mesut Ozil and dropping Thomas Muller, although the Gunners’ midfielder could not inspire his side to victory. Low has been in charge of Germany since 2006, taking them to the final of the 2008 European Championships where they lost to Spain and then that subsequent World Cup glory. The future of some of Low’s key players is also in doubt after this shock loss. Low insisted that German football still had a bright future despite this failure. With Sweden winning 3-0 against Mexico in the other Group F game, and it being goalless in Kazan, Germany knew they had to score in a frantic finish. A win for Germany would have edged Mexico out on goal difference – but the drama came at the other end as Kim put the ball into the net, although it was initially ruled out for offside. However, the VAR review showed the ball had deflected into Kim’s path off of a German player – Kroos – and the goal was given. With Germany desperately looking for a goal to get back in the match, Neuer joined the attack. But he was caught out as a long ball left Tottenham forward Son with the simple task of walking the ball into the net to spark jubilant celebrations among the Asian side, even though their elimination had already been confirmed. The Germans will regret their wastefulness in front of goal when the game was goalless. South Korea’s goalkeeper Cho Hyeon-woo made a fine one-handed save from Leon Goretzka’s header and Timo Werner volleyed wide from near the penalty spot. Mats Hummels headed over the top when unmarked six yards out in the closing stages, before South Korea’s two late goals. It means Germany’s hopes of becoming the first team to retain the World Cup since Brazil’s victories in 1958 and 1962 ended in embarrassing fashion. South Korea went into the match with no points from their opening two games after losing 1-0 to Sweden and 2-1 to Mexico. However, they had a mathematical chance of qualifying for the last 16 for only the third time in 10 competition appearances, although they needed Mexico to beat Sweden. South Korea had the first chance when Jung Woo-young’s free-kick was fumbled by Neuer, who punched clear bravely as Son tried to convert the rebound. The Tottenham forward also lashed a volley wide when it was goalless, before being booked in the second half as referee Mark Geiger thought he had dived in an attempt to win a penalty. Even though the score in Ekaterinburg ended South Korea’s hopes of going through, they still sensed a memorable win over Germany. The team ranked 57th in the world achieved that victory thanks to the two late goals, both of which were celebrated as if they had qualified themselves. This will fall on Joachim Low for the way he organised the team. There was no real balance to the side. The players will take a hammering but most of it will be for Low. I think they underestimated South Korea and it didn’t make sense to put Sami Khedira and Mesut Ozil back in. A terrible day for Germany. I did not see it coming. I thought Germany would’ve brought the momentum from the Sweden game into today, but they started so slowly without any intensity. Why was Manuel Neuer ahead of two forwards for the second goal? He is a loose cannon. What was he doing playing on the left wing? He is a goalkeeper – why is he in that position? It was an open goal for Son and the Germans have got what they deserve. Those players are characterized by arrogance. Earning millions a year mess up the personality.